Comic book events are an interesting bunch. Back then, it would be like, "My gosh, they're all there. I need this, it's going to be so awesome." Today it's like, "Oh great, hopefully it'll be better than the last one." What happened here? You would think as the years went by, Marvel would get better with their events. But that's not case, with recent follies such as Secret Invasion and Fear Itself, it seems that the company just doesn't know how to do a good event these days. 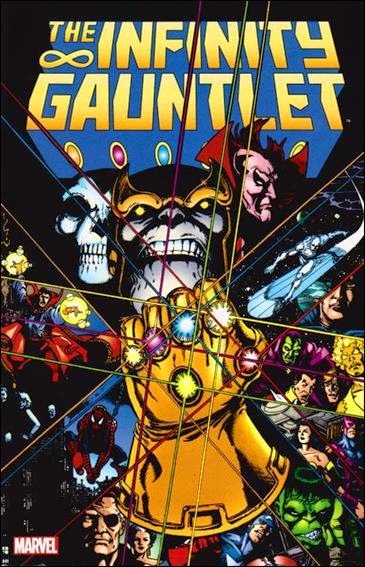 The Infinity Gauntlet is the second major Marvel event, the first being Secret Wars. It's about how an evil titan gains unlimited power and seeks to win the affection of Mistress Death. Twenty-one years later, it still holds up amazingly. As you all know, that mad titan is Thanos. Thanos is one interesting villain. He seems to be truly evil, but only wanting Mistress Death's affection. Issue One is proof of this, he eradicates half of the universe's population for her in a single snap of the fingers. No, this isn't Dragon Ball Z. And if you think that's insane, later in the event, some of two Celestials hurl whole planets at Thanos as an attack. Wow. They really went all-out for this event. (Seriously, whole planets are hurled, you will have to read it to believe it.) The first issue of this event did a perfect job of captivating the scope. The writing in this issue is just great, Mephisto explaining to Thanos about how great the titan is, among other things. Mistress Death has a pretty quiet role in this event, until the surprising turn of events when she turns on Thanos. That was a great moment, and just one of the many great moments in this event. Fear Itself wanted to be bound in reality, to be realistic, from the public's point of view. It failed. It failed miserably in that aspect. So here we have The Infinity Gauntlet, an event where whole planets are hurled as weapons, that does a better job of being grounded in reality than Fear Itself. A great example would be the scene where Black Widow attempts to save a woman, fails, and falls to the ground, defeated. Then some bystanders pick her up saying "You did all you could." Good stuff. Then the whole earth moving out of orbit moving into a new ice age was felt. As the issues went on, the scope got bigger, and bigger, I don't think any Marvel event has reached the level of scope this event did. I'll explain why in the coming paragraphs. I don't think I've ever read a comic where the situation looked so bleak for the Marvel heroes. As they go into space to confront Thanos, you can tell that they all feel an impending doom. As they're getting beaten up, it's just hard to imagine how they could win, cause they literally can't. Thanos literally destroys a bunch of heroes. (Cyclops, Nova, Thor.) Their deaths don't feel thrown in for shock value. It's shocking, but surprising, genuine shock. Thanos controls everything, and actually wins, but made a mistake, which I'll address soon. There are some great moments in the line of battle. Wolverine face to face with Thanos was great, and the scene with Spidey webbing the titan's face had me laughing out loud. The greatest scene, however, is when Captain America walks up to Thanos. A great quote is "As long as one man stands against you, Thanos, you'll never be able to claim victory." Then they have a short, dramatic fight. Cap, a man, against a being with a god's power. As you might expect, Thanos breaks Cap's shield. I like the scene soon after when Cap lets Thanos have it with a punch to the jaw, then Thanos slaps him to the side. Another wow. There are so many great scenes in this event. One must wonder how the Silver Surfer failed in Issue Four. C'mon, the words were that he 'misses his mark.' You're going to tell me that a being as smart as the Silver Surfer will miss with all that's at stake? This event is also famous for bringing back Adam Warlock. He has his fans, but I found him incredibly dull throughout the whole event. The emotionless type, which is fine, but he just comes off as rather dull. The scene where Thanos becomes the new Eternity was both awe-inspiring and probably the most scary moment for the Marvel universe. He didn't realize his one fatal mistake: Leaving his mortal body with the Gauntlet on with a supposed unconscious Nebula, his granddaughter. Nebula then seizes the Gauntlet for what might be the biggest turn of events in all of comics. What follows is Nebula becoming an all-powerful being, the only problem is that she isn't too smart. Though what follows happens a bit too fast. Thanos gets warped back as Nebula makes everything as it was twenty-four hours ago. I'm surprised at how fast it goes that the heroes ally themselves with Thanos, it all happens a bit too fast. It was great seeing Odin bring some of the other gods to the Asgard table. (Yup, he has some dialogue with Zeus in this one.) It was great, but the sad part is that they don't contribute to the fight against Thanos at all. They get stuck in Asgard, it almost feels like the whole scene with them was a waste. However, the thing that brings up the scope like no other event has done is the inclusion of, well, the universal beings. Galactus. Kronos, Love, Hate, Order, Chaos, two Celestials, they're all there. Their battle with Thanos defines "epic." (Remember the hurling planets? This is where it happens.) One of the early and most dramatic scenes was when Eternity tells the Living Tribunal about the unbalance Thanos is causing, then the ladders says, "The strong replace the weak. It is as it should be. No cosmic crime is being committed. The Living Tribunal shall not become involved in this manner." Then he just leaves, it's amazing stuff. Thanos has apparently surpassed Eternity and will reign supreme, and that's how the balance works, according to the Living Tribunal's logic. Then after the great battle, Eternal reveals himself, saying that he's here to reclaim control of that reality. After some great dialogue, they go at it, and then an explosion. Thanos winning didn't come as a surprise, but the fact that he was the new Eternity and that he left his mortal body was just incredible. Did I mention that Dr. Doom is the only villain to join the heroes? It's quite interesting, but I find it rather odd that after getting blasted from the Gauntlet, his first thought is "I will not be denied those gems!." The pacing is great, with Issue One, Two, and Three building up for the confrontation in Issue Four. "The Cosmic Battle on the Edge of the Universe" was a satisfying issue, that's how you do big event fights. I still don't get why Hulk didn't want to help the Avengers, I mean, if it was a smaller threat, it's passable, but c'mon. This is a world-changer. Really, the two characters that made this event was Cap, for bravery, and Thanos, for being a perfect villain for this event. Overall, The Infinity Gauntlet is truly an "event." It feels like "the end of the world" and that the heroes have no shot at winning. You have a greatly developed villain who has character, and the scope is huge. The fights were great, and the writing by Jim Starlin is great. This is how the wring should be be done. The art is crisp and clear by George Perez and Ron Lim, whose art easily beats what we're getting in the current Avengers series. The point is, this event is twenty-one years old, and some of Marvel's modern events pale, and I mean PALE in comparison. This event had the scope, the villain. the battles, everything. While it may have some questionable characters, (Drax and Pip being nothing but duds) it's an event filled with amazing character moments. The Infinity Gauntlet is a highly recommended read, it has everything a Marvel event is supposed to have. Did I mention that it has planets being hurled as weapons?